The U.S. military employed an organized system for the treatment of soldiers severely wounded while fighting in the Pacific, including their evacuation stateside if needed. This system was based on the concept of medical care echelons. Echelon I comprised an aid station/unit dispensary, while Echelon II referred to collecting or clearing stations. Mobile hospitals for evacuation, emergency surgery, and convalescence made up Echelon III. Echelon IV was composed of the general hospitals, hospital centers, and station hospitals. Echelon V was made up of hospitals in the Zone of the Interior. This story was first published in theFebruary 2015 edition of WWII History . Order your subscription here ! It should be emphasized that this nomenclature was devised for medical care for the wounded mostly in the European Theater of Operations (ETO); however, it was also applied for the treatment of wounded American soldiers, Marines, and sailors on remote jungle battlefields in Burma and the South Pacific. Often routes through the jungle battlefields of Burma and the South Pacific islands were no wider than a column of troops trekking in single file. Allied soldiers required mules and horses to carry the heavy equipment and supplies. In addition, wild vegetation—12-foot tall, razor sharp elephant grass, dense bamboo forests, and mangrove swamps—presented further obstacles for the troops. Wild animals and venomous snakes inhabited many areas crossed by troops of both sides and caused non-battle casualties. Disease-laden mosquitoes, poisonous scorpions, biting flies, and leeches infested the impenetrable forests and swamps. One salient issue that emerged for these remote, often impenetrable battlefields was what to do with the wounded. The Allies had paid a high price in military personnel and negative morale after the debacles of the British retreat in Burma in 1942 and Operation Longcloth in 1943, conducted by Brigadier Orde Wingate and his Chindits. Simply leaving the wounded and accompanying medical caregivers with either local villagers or to the Japanese resulted in executions and atrocities and was no longer an option. General Douglas MacArthur’s advances in New Guinea in 1943-1944 and the Allied invasion of northern Burma were to be true offensives and as such would possess frontline and rear echelon capabilities of treating and evacuating wounded troops. Control of the air and the emergence of larger fleets of air transport craft to ferry the wounded from the front line to the rear echelon would add greatly to the care administered to the wounded. A typical pattern of events occured once an infantryman became wounded during combat. Within minutes of someone “getting hit,” a company medic or aid man would cautiously crawl to the wounded soldier, assess the extent of the wound, and begin the actual treatment process, which at this level would include field dressings and tourniquets to stop the bleeding and placement of antibiotic sulfonamide powder onto the wound, coating it immediately to minimize the likelihood of infection. With time, more potent antibacterial agents such as penicillin and streptomycin were being used in rear-echelon areas. At this initial juncture of treatment in the jungle, medics learned that dressings had to be dyed khaki or green because Japanese snipers took aim at white bandages. At times, even casualties tore off their white bandages to prevent becoming easy targets. Survival depended on a number of factors, including the type and location of the wound and the proximity to medical care. Soldiers in the Pacific usually fared worse than their counterparts in Europe. An actuarial approach was applied to the chance of survival after being seriously wounded. If appropriate and adequate treatment were initiated within an hour, there was a 90 percent chance of recovery. After eight hours the likelihood of survival fell to 25 percent. Thus, rapid movement of the wounded to advanced field hospitals increased the survival chances of battlefield casualties considerably. After being initially treated by a combat medic, if the wounded soldier was fortunate, a litter team of four men from a forward aid station would be summoned, usually by portable radio or field telephone immediately after first aid was applied. Again, depending on the severity of any ongoing combat, the litter team could often arrive within 30 minutes of the wound being inflicted. The litters would be carried back to wherever the aid men had left their jeep or mules, often a distance of 25 to 100 yards or more. Ideally, those needing immediate surgery went to the portable surgical hospitals while those not so seriously wounded or too ill to remain near the front were sent to rear clearing or collection stations. When the 3rd Portable Surgical Hospital arrived, after flying from Port Moresby into Dobodura, New Guinea, it carried its 1,250 pounds of equipment in pack frames and hauled it to the front near Buna Mission by mules. Once there, the medical personnel set up close to the divisional forward clearing or collecting aid station, which was only about 300 yards from the entrenched Japanese positions. It was the mission of the surgeons at these portable surgical hospitals to provide emergency lifesaving and stabilizing treatment. They did not hold any soldiers who were ill with fever or those who could safely travel to the rear. Throughout the day and night, bullets struck the tents. During a single week, its first on the line, 3rd Portable Surgical Hospital personnel performed 67 major surgical procedures, including amputations, bowel resections, and other operations that would challenge a metropolitan urban hospital’s capabilities. It was at these divisional clearing or collecting stations that a more thorough examination of the wound and triage would be conducted and, if needed, an emergency operation performed. The surgical team consisted of the head surgeon, his assistant surgeon, an operating room scrub nurse, and someone administering the anesthetic. 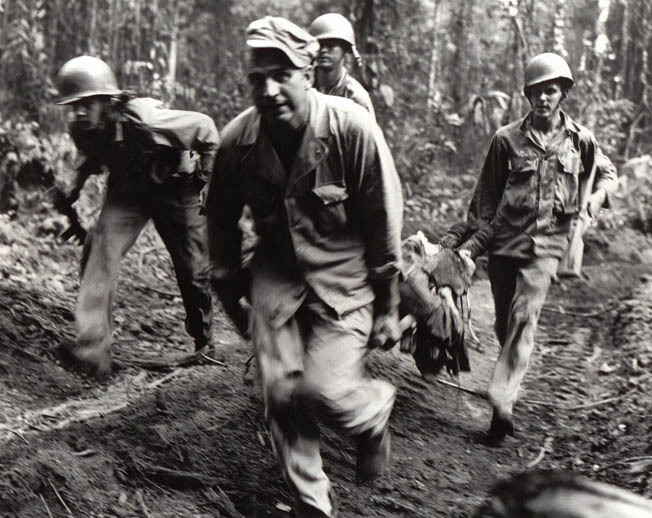 Medical personnel prepared casualties for evacuation by jeep, boat, or litter to ambulance loading points for transport to rear collecting stations that stood under canvas approximately 21/2 miles behind the initial battalion aid stations. Additional emergency care, mostly plasma and more morphine, was provided at these rear collecting stations. If further surgery was required, updates were made to the wounded soldier’s medical tag. Then any available transportation took the casualties to field hospitals, usually also under canvas approximately three to four miles to the rear. Some portable surgical hospitals were present at the field hospital locale if emergency operations became necessary. Just because these field or portable surgical hospitals were in the rear did not exclude them from harm’s way. Field and portable surgical hospitals were bombed and shelled unmercifully by the Japanese. The hazards faced by medical personnel were, in some cases, similar to the medics being shot at while carrying litters or dragging wounded to battalion aid stations or dressing wounds in the field. Allied surgeons working in Burma began to develop alternative treatment methods more suited to jungle conditions. Limb wounds were left open, and damaged muscle and bone were excised. Sulfonamide powder and a protective layer of lint covered with Vaseline were laid on the raw surface before the appropriate splint or plaster cast was applied. This was done to relieve any tension in a wound that would develop if immediate closure were performed in the hot, humid climate. Even some abdominal wounds were left partially open, as infections often developed if wounds were completely closed. As with limb wounds, the procedure was to clean the wound and leave it open for around 10 days, after which it could be sutured. By late 1944, radical excision of wounds, improved evacuation (preferably by air), and the introduction of newer antibiotics such as penicillin improved survival rates. Most jungle battlefield casualties were then receiving treatment within hours due to the increased mobility of field hospitals and the extensive use of air transport as ambulances. It was not until World War 2 that the enemy killed more American troops than disease did. Thirty percent of those wounded in action during World War 2 ultimately died; however, the vast majority survived. During most campaigns in World War 2, for every single American soldier killed four or five were wounded. Of these, one would be seriously wounded and would no longer see combat, while another would have serious wounds taken care of to such a good extent that a return to action was possible. The valor and heroism of these combat medics, physicians, surgeons, and nurses cannot be overstated as they worked under extreme conditions to render lifesaving care and dramatically increase the chance of surviving a wound on a remote jungle battlefield in Burma and the South Pacific islands.